Today I went to Zumba class and this was a brand-new Saturday morning Zumba class and there were only three of us. It was an African-American girl, a Latina girl and me. Guess who was the square? OK, the instructor was white too although she is not so nerdy -- or as lucky -- as to be writing the biography of Leonard Pennario. Well, we all had a lot of fun and I think we all got a kick out of the situation. A small Zumba class is one of life's great pleasures and surprises. You get attention from the teacher and each other. We worked a little harder on our steps than I think we would have otherwise. Anyway, nice class! After that I went to the Clinton-Bailey Market with my friend Jane. I shrink from thinking what we bought. Tons! It is great to go with a buddy to the market because then you can buy in bulk and split it. Our greatest score was a major haul of zucchini and yellow squash all for $2. It was about 20 squashes! Also, tomatoes. They are new in season but we split a $5 basket which was the biggest we saw anywhere for that price. Cukes and cantaloupe for my mom and Swiss chard for me. A good day! And beautiful weather for the market. There was a ton of Muslims! I kept imagining I was in Morocco. 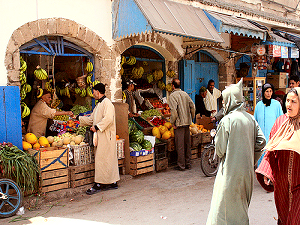 That is a picture up above of a Moroccan market. Here is another. 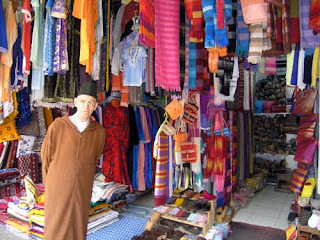 Get out, they sell all those great clothes in Moroccan markets? How come all these immigrants do not sell these clothes here? I wish we had markets like that. Imagine the look I could put together for Zumba! Oh well. Back to the Clinton-Bailey. The honey woman said she had seen my brother George so good, that meant he was back from Chautauqua. Last night when I was having a beer with my mom at the Glen Park Tavern we called him and that was where he was. After the market I brought the cucumber and cantaloupe to my mom and took her to the Audubon Library. Zut alors, I got lost! I do not know my way around East Amherst. And fatal error, I detoured to a garage sale and got tangled up in a series of cul-de-sacs. I had to go to that garage sale! I could not leave that garage sale alone! It was like driving to Ohio but we finally got to the library. I borrowed two cookbooks. I am going to need them to get through everything I bought!